Nursia is the ancient name of this splendid city that since the antiquity has been an important center during the dominations by Romans, Longobards and Goths that followed each other in the region. 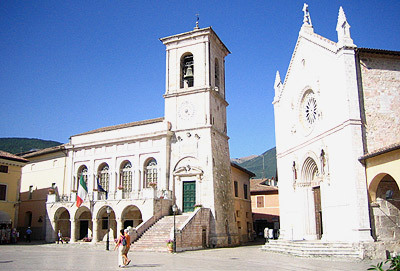 Currently Norcia is surrounded by one nearly intact city-walls with eight doors. The city has always suffered of earthquakes to the point that for fear the buildings was not never develops in height. Here was born Benedict who gives the name to the Public square and to the Basilica, built up on the place where once the home of the saint rose. Norcia is famous for its production of local salumi and along the main street it's possible to admire strange shops literally packed of salumi: the norcinerie.